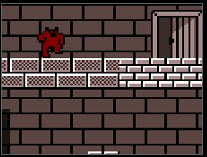 Bear in the Dungeon is another new retro platformer flash game on gamesfree and we must say that it's one heck of a difficult game. Play as bear whose job is to find the way out of the dungeon full of deadly obstacles. Jump from platform to platform with precision and climb walls. In some levels you need to find keys that will enable you to access specific parts of that level you are in. The game is quite a challenge and requires some skills so maybe that's why we don't see any complete guide around as of now. As for the Bear in the Dungeon walkthrough, this is all we've found so far (we'll update this when a complete guide shows up).